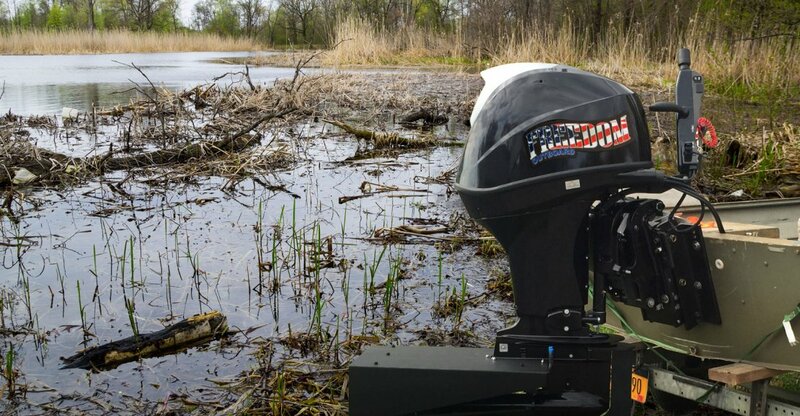 The freedom mud motor is designed to enable boat owners to explore environments traditionally considers off limits to an outboard motor. 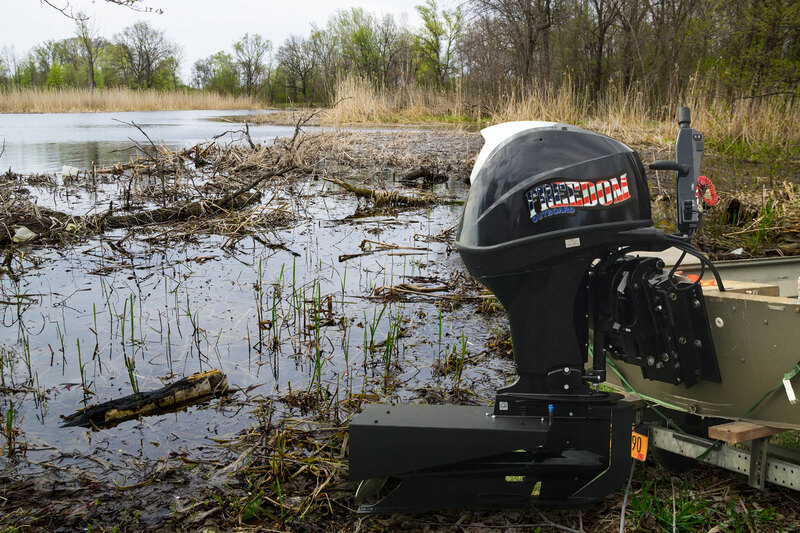 The freedom mud motor includes a 5.5″ electric over hydraulic breakaway jack plate and extended lower unit to allow the motor to successfully cross soft bottom shallow water areas without concern. This 6200 rpm four stroke EFI motor features a closed loop cooling system in place of a traditional open loop cooling system used on conventional outboards. The closed-loop feature extends the life of the motor by preventing mud, debris, salt or other fouling materials from eroding the engine block or plugging the small water passages in the internal of the block that would allow hot spots that will damage the engine. The lower unit features a medium duty front bumper to prevent damage to the gearbox and lower unit skeg in the event of an unintended impact with a submerged object. 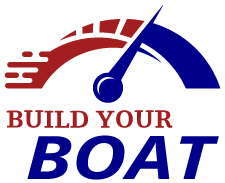 Outboard motors are typically designed as open loop cooling systems. Meaning the motor draws water from the host body. That water is circulated through the engine, and fuel pump to maintain prop engine temperatures. After passing through the engine or fuel pump the water is then dumped back into the host body. Positive attributes of this design – The single pass water cooling system is an ideal design for traditional outboard users. The system is low cost, and reliable. The never-ending supply of cold water allows the engine to be kept cool. Negative attributes – The primary negative issue that plagues outboard motors is related to the internal cool passages plugging due to water being drawn from the host body is carrying debris such as weeds, mud, seeds, and small gravel. The second issue is related internal block passages oxidizing to the point that holes develop and render the motor unrepairable. The Freedom motor is a closed loop cooling system functionally identical to the system in your car or truck. 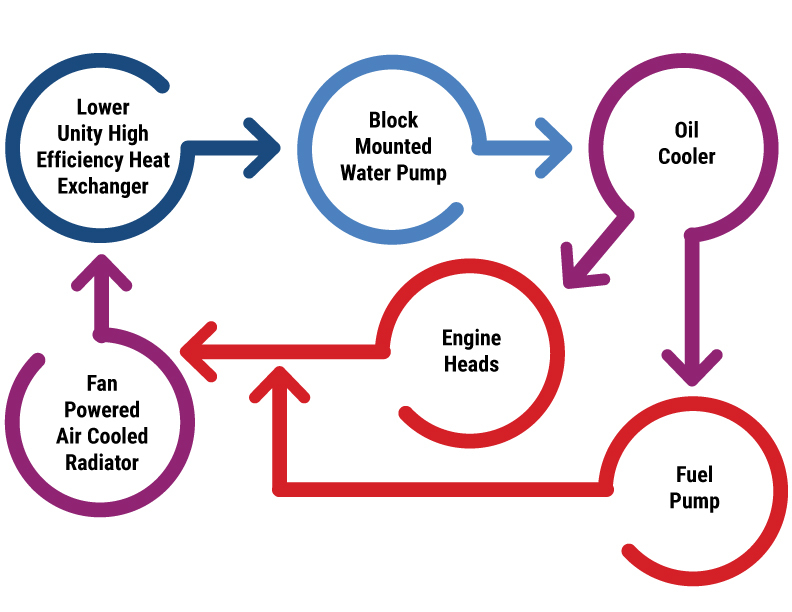 Water flows from an engine mounted water pump into the engine oil cooling system, then the flow of coolant follows the engine manufactures stock coolant flow path through the block, head, and fuel coolant systems. Upon exiting the engine and fuel pump coolant is collected and channeled into the fan powered air cooled radiator and past an expansion chamber and then through a high-efficiency heat exchanger on the lower unit prior to returning to the water pump. Smart tiller – Is a multi-function tiller handle features an ergonomically designed shift lever for easy and convenient shifting as well as a longer throttle grip with 110 degrees rotation for easier maneuverability. All controls on the new multi-function tiller are conveniently located on the handle for easy access and control; the gear shift, throttle control, trim switch, safety lanyard cord, warning lights, and electric start key switch are all integrated in the tiller handle. 2 stage closed loop cooling system. Primary cooling system is enclosed in a cage and partially wraps the upper foot. Lower unit cooler also serves as a anit-ventilation plate. Medium duty front bumper , prevents damage to the lower unit due to submerged solid objects. 3 Blade Stainless steell proppellor with 3x thick blades. The propeller features a replaceable hub. 6200 rpm Four stroke EFI, liquid cooled engine. Fully enclosed engine cowling to reduce noise and protect sensitive electrical equipment. Adjustable friction tab to help control torque steer, helps to improve driver experience. Electric over hydraulic Power trim. Variable Idle speed control standard 650 – 950 rpm. Safety lanyard for driver safety.